Sales of crossovers and SUVs have been surging basically all over the world in the last few years to the detriment of MPVs. That’s why the second-gen 3008 introduced earlier this year made the switch from being a multi-purpose vehicle to an authentic crossover. It’s the same story with the 5008 unveiled today, a former MPV that now takes the shape of a larger crossover. The similarities between the new 3008 and 5008 are more than obvious, up to the point that it would be hard to distinguish which is which if it weren’t for the size differences and the third-side windows. The photo comparison below perfectly demonstrates the shared design between the two new high-riding models from Peugeot. Compared to its predecessor, the new 5008 is 11 cm (4.3 inches) longer and 11 cm wider to enable a more spacious cabin that can seat up to seven. Speaking of the interior, the second-row passengers sit on three separate, folding and tilting seats and get to enjoy an extra 60 mm (2.3 inches) of knee room. As for the third-row seats, these are not only foldable, but also removable whenever you want to carry more cargo. As a matter of fact, Peugeot says that in five-seat guise the new 5008 provides a best-in-class 1,065-liter (37.6 cubic feet) capacity. Fold the front passenger seat and you’ll be able to carry long items up to 3.2 meters (126 inches). To make your life easier, a hands-free electric tailgate is going to be offered as optional equipment (standard on the flagship GT). 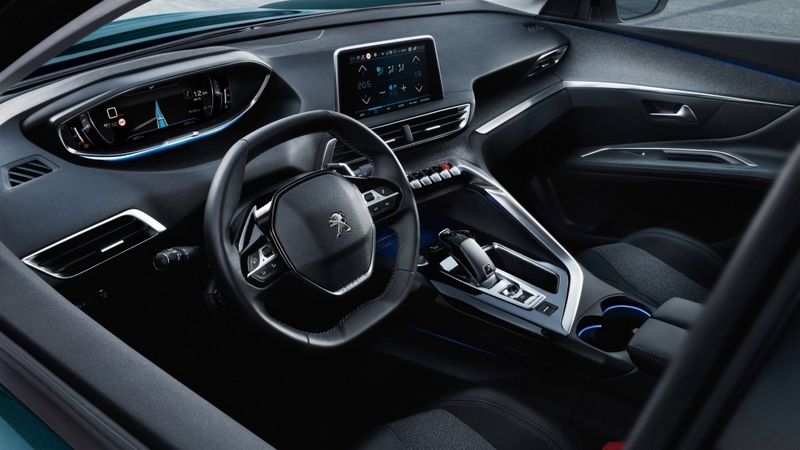 The fantastic second-gen i-Cockpit seen in the latest 3008 will be available on the larger crossover and will combine a 12.3-inch digital instrument cluster with an 8-inch touchscreen for the infotainment system. Much like the latest 3008, the new 5008 rides on the same PSA-developed EMP2 platform and is going to be available with four gasoline and six diesel configurations, depending on location. Buyers will get to pick from a 130-hp three-cylinder 1.2-liter PureTech linked to a six-speed manual and available in a more frugal version slashing CO2 emissions to a low 115 g/km. The same unit can also be hooked up to a six-speed auto which is standard on the beefier 165-hp 1.6-liter PureTech four-cylinder engine.